Tuesday, Nov. 20, 1888 Mercury 42° P.M. & as pleasant still. All moving on much same with our folks & in usual health, but Ch- being without teeth still prevented her attending with El- & others marriage (at M. E. church & reception at home) of Anna May this eve. El- also at funeral service of Ans- Goodykoontz in P.M. at same church. 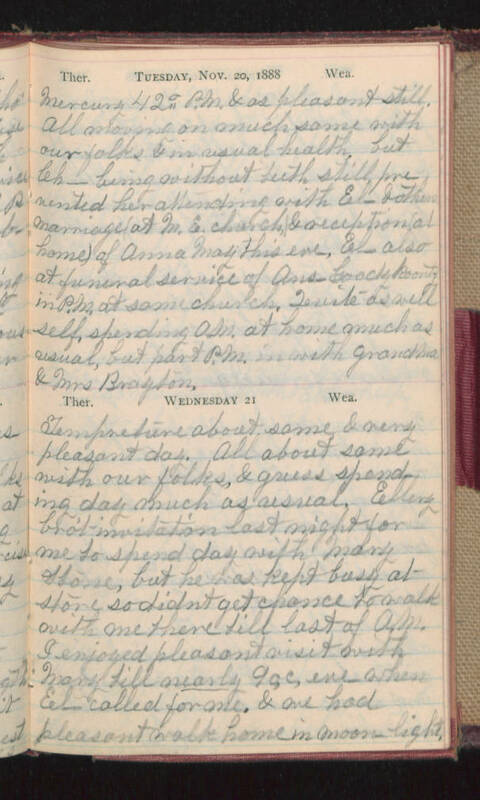 Quite as well self, spending A.M. at home much as usual, but part P.M.in with grandma & Mrs Brayton. Wednesday 21 Temperature about same & very pleasant day. All about same with our folks, & guess spending day much as usual. Ellery bro't invitation last night for me to spend day with Mary Howe, but he was kept busy at store so didn't get chance to walk with me there till last of A.M. I enjoyed pleasant visit with Mary till nearly 9 o.c. eve- when El- called for me, & we had pleasant walk home in moon light.